Am I right in designating Primordial’s latest release a “major event”? What is a definition of a “major event” anyway? To some, it is an album by a band with a worldwide renown and reputation. To others, it is a release by their favorite band, no matter how little known. So, I am going to going out (hopefully not on an extremely thin) limb to call Where Greater Men Have Fallen a “major event”. After all, Primordial is one of my favorite bands AND they have a worldwide well-deserved status. So, if you also think the pride of Ireland have been making the mark on metal recently, read on. I remember long ago buying Imrama full-length and The Burning Season EP, my first introductions to Primordial, in the dirty, marijuana smoke filled, used CD shop on one of my business trips to Columbus, OH. I can’t say I was immediately blown away. Then, slowly, beginning with The Gathering Wilderness Primordial elevated itself to provide me with some most enjoyable listening experiences. If not improving further and further with every step, To the Nameless Dead, then Redemption at the Puritan’s Hand, at the very minimum the Irishmen were delivering one quality statement after another. Some call Primordial music atmospheric and epic, others folky and blackened, but in my mind I have christened them “cleansing metal”. I put Primordial on when I need to reach the state of catharsis, to disassociate myself from the mundane everyday problems, but not be either blasted away or mellowed down by something barely heavy. To the Nameless Dead and Redemption at the Puritan’s Hand have done exactly that for me, while maintaining heavy guitar riffs, weaving Celtic melodies and bleeding almost incomparable oodles of passion. So I certainly would not mind if Where Greater Men Have Fallen “stagnated” in that state of darkened pain-craving beauty. A week through the album, I do not think they kept things exactly the same, yet I am very satisfied with where this album has taken me. 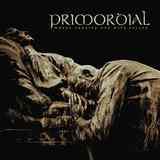 Having changed the studios and the producer, Primordial still delivered plenty of what has become their riff-oriented Irish epic darkness. At the same time, in apparent self-prevention check from getting stale, the band has a few unexpected moments. The title track is a perfect opener, bridging Where Greater Men Have Fallen with the albums that came just prior. Staying with long, seemingly endless, songs (take that, doubters) the title track does it in the unusual for Primordial verse-chorus-verse-chorus manner. Melodic inflections do not always go in the directions where you expect them to, and there is a huge burst breaking the song wide-open midway through. From the same vein Come the Flood is an incredible dark waltz, and Born to Night settles into the same “cleansing metal” style after what is 3.5 min of muffled acoustic Celtic dawn. Closer Wield Lightning to Split the Sun is another majestic sorrowful track previewed by a cleaner acoustic. Then there are what I call the “other” tracks. The Seed of Tyrants is a complete jolt to the system, harsh, going back to the early roots, with echoing vocal layering. With rhythms changing subtly from blasting to double bass you find yourself riding this black storm wave in the end, rather than be bowled over by it. Babel’s Tower is a dragster, which undergoes incredible development as it unfolds. Slower tempo and newfound organic sound make the emphasis of percussion, and guitars/bass interplay just finger the fibers of your heart between the strings. Ghosts of the Charnel House is Candlemassy in its doomy gait, but somehow has a hopeful atmosphere, despite its title. Whenever Primordial has atmospheric breaks (Babel’ Tower, Come the Flood), they are also extremely effective. The only track I did not dig was The Alchemist’s Head. It is weird, nervy, and somehow sideways compared to the rest of the album. With its angry and noisy feel it did not let my weary soul rest. Thoughtful lyrics and fantastic wails by A.A. Nemtheanga deserve separate mention. He has got to hold the title of the most passionate yet the best enunciated singer in metal. He can be dreamy and prideful (Wield Lightning to Split the Sun), sing along with his Celtic merry men crossing hands on the shoulders while standing in the circle (Ghosts of the Charnel House), or be distraught beyond belief burying his head in the blooded hands (Come the Flood) while burying his children (title track). These are my interpretations of things happening, so blame the interpreter if I misunderstood. To summarize, as shaky as my hands were popping the album in, it did not disappoint. Having it on pretty much non-stop for a week, there are several masterpieces here (title track, Babel’s Tower, Come the Flood), the rest of the songs are very good, meaning they will grow on me further, and only the one track I did not like. I will try to keep my optimism in check while issuing a grade, but I think every point in my score is well deserved. With Where Greater Men Have Fallen Primordial did nothing to shake them off the pedestal I put them on.